So, you have blue eyes; lucky you! Blue is one of the rarest, and also one of the most sought-after eye colors to have (probably because it’s rarer). There are countless different shades of blue, but if you have them, you probably want to make them stand out! If you’re having trouble figuring out how to do just that, then we have the solutions you need, and all of the methods to make blue eyes pop with makeup. Let’s get started! Let’s get back first, to talking about shades. Blue eyes are usually separated into three categories: light blue, gray-blue, and dark blue. Light blue typically features sky blue and silver shades, where gray-blue is (obviously) gray with special appearances by green shades. Dark blue is pretty easy to guess, and is the darkest of them all, with a color similar to our oceans. Not every makeup item works the same for one shade as it would on another, so keep this in mind before anything else! Looking for the best eyeshadow palette for blue eyes? Or maybe you’re just looking for a singular shade to make them really stand out? We’ve got you covered. Using just the right shades of eyeshadow is one of the most essential and honestly easiest methods to help your peepers stand out. Generally speaking, if you want a certain shade to stand out, you’ll want to pick the complementary color of that shade, or the “opposite” color, if you will. For blue, it’s opposite is orange. No, you don’t have to wear bright orange, but choosing similar shades will help. Traditionally, if you’re wondering how to make blue eyes bluer, you’re going to want to select a shade of brown. Golds, coppers, peaches, and oranges are an excellent addition and can be used along with the browns, or on their own for a more dramatic look. The warm undertones of these shades do wonders for sharpening blue eyes and can even bring out golden flecks that are often seen in blue eyes if you look close. If you’re looking for eyeshadow palettes to help you do this, we can’t recommend the Naked Heat palette by Urban Decay, enough! You’ll notice it has a wide range of all of the shades we have previously mentioned, so you get a ton of dimension and diversity. Burnt oranges, sienna browns, and more; you’ll love what you can do with it. Want a gorgeous bronze glitter look? Check out this tutorial for a step-by-step guide on how to get it! If you’re looking at various shades of eyeshadow for blue eyes, you can’t forget another: purple. While it may seem “too similar” to blue, it actually works extremely well to enhance blue eyes. It perfectly compliments cool blues, making them appear even brighter than they actually are. If you have gray-blue eyes, you’re probably going to want to bring out the blue more. If that’s the case, we’d recommend going with a natural peach tone (we personally like the L’Oreal Paris Colour Riche Pocket Palette Eye Shadow in French Biscuit). It’s important to only wear this shade on the top lid, as if you wear it on both, it can make you look tired, and even give a “sick” look to your eyes. If you have light blue eyes, you’re going to want to go with orangey hues, or even a burnt orange, or orange-based red. With dark blue eyes, you’ll want to work to brighten them. You can easily do this with some yellow-influenced eyeshadow. The yellows will enhance the dark blues, making them look lighter while enhancing the baby blue flecks. If you’re not afraid to take a walk on the wild side, we also adore silver with blue eyes! The silver brings out any shade of blue and makes it look much more brilliant. If you have light blue eyes, we love it twice as much! It brings out all of the baby blue flecks and makes them look even icier. Generally speaking, if you want to make a color stand out, you’re not going to do it by using the same color. 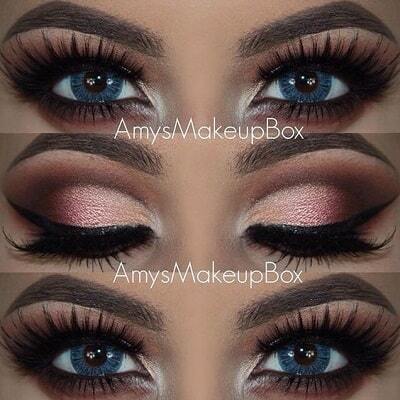 While blue eyeshadow works well with brown eyes, it does not work as well with blue. It actually washes out the color of your eyes, and can just end up looking overwhelming and “too much”. How to make blue eyes pop with eyeliner? Follow our lead! Despite what we told you about blue eyeshadow, we go back on our word when it comes to using eyeliner. In fact, blue eyeliners, purple eyeliners, browns, and even blacks are what will give you the most pop! With blue eyes, we really like the creamy eyeliners. Our personal favorite is the 24-7 Glide-On Eye Pencil. It may come in pencil form, but it’s probably the softest, creamiest, most blendable pencil liner you’ve ever experienced! Our personal favorites on blue eyes are Alkaline, Demolition, and Whiskey. You’ll see many blogs and YouTubers suggesting to only use eyeliner on the top lashline. This is because it can make eyes look smaller, especially if you already have small eyes. For us, this again, comes down to the shade of blue your eyes is. If you have small, dark blue eyes, we’d recommend what others say, and just wear it on the top lashline. This will give your eyes a wider appearance, and let the blue hue become more obvious. If you have gray-blue light blue eyes, then your eye color is only going to stand out more by being framed with liner. If you want to make them look bigger, then of course, only go with the top lashes, but super light eyes look incredible either way. Blue eyes typically just intensify when surrounded with eyeliner. Now that you know how to intensify blue eyes with eyeliner, it’s probably a no-brainer that the same applies for the lashes. Eyelashes work to frame our eyes in beautiful ways (as well as protect our eyes from debris, but anyway). By adding mascara to them, we darken them, lengthen them, and thicken them. This not only gives us those coveted camel lashes, but it also makes our eyes stand out more, no matter the color, shape, or size. 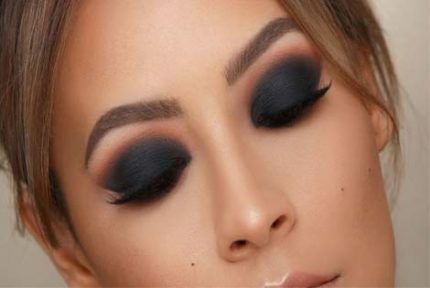 Black lashes will make your eyes pop incredibly, so you don’t want to skip this step. If you want to take the enhancing to a whole new level, try on some fake lashes, or if you want to make more of an investment, you can even opt to get lash extensions. That way, you don’t have to worry about reapplying the lashes every so often; just go in every month or so for a “refill”. What About The Rest of The Face? This depends on a few different factors. One is how light your skin is and how delicate your features are. Next, is which colors you’re wearing on your eyes. Are you wearing deep purples or browns, along with heavy liner and mascara? If so, then in most cases, we’d recommend you take the rest of your makeup easy. Perhaps a lighter gloss on the lips, and some pink blush just to give you a bit of color. However, if you’re going with a golden or peach shadow, then go all out! You can wear bright or deep red lips and even add some contour if you’d like. Overall, just make sure everything is balanced. Now that you’ve read all about the methods to make blue eyes pop, you’re probably ready to go try them all out! Remember, in the end, there is not “wrong” way to do your makeup, and we only try to give you the best tips and tricks to have you looking and feeling your best! If you’re new to this, then start out small. Start out with the lighter shades and progress from there! A little over a year ago, Jennifer quit her job as a PR consultant to backpack through Europe and Southeast Asia, where she decided to turn her passion into a business and launched JustWomanThings. © 2019 Just Woman Things. All rights reserved. 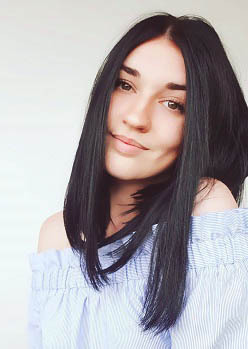 Just Woman Things is a participant in the Amazon Services LLC Associates Program, an affiliate advertising program designed to provide a means for sites to earn advertising fees by advertising and linking to Amazon.com.